Since March 2016, the Southern Poverty Law Center (SPLC) has tracked 329 flyering incidents on 241 different college campuses across the United States, a number that continues to grow. Last updated on October 17, 2017. Some of the groups leading the way in this effort are Identity Evropa, The Right Stuff and Vanguard America. Flyering activities are an integral part of the racist “alt-right” movement as they provide a simple way for “a convert to [become] a committed supporter.” Flyers have the distinct ability to draw attention to the group and cause while keeping the member in the shadows. These incidents represent a new rise in hate and recruitment for hate groups on college campuses. Identity Evropa, the brainchild of ex-Marine, Nathan Damigo, came to fruition in March 2016. With close ties to Richard Spencer, the group aims to hide its white supremacist ideologies behind a pseudo-intellectualized facade. From their “fashy haircuts” and pressed khakis to the group’s sleek website, aesthetics are everything. This motive is certainly not lost on Identity Evropa’s flyering endeavours, arguably their most notable activity. 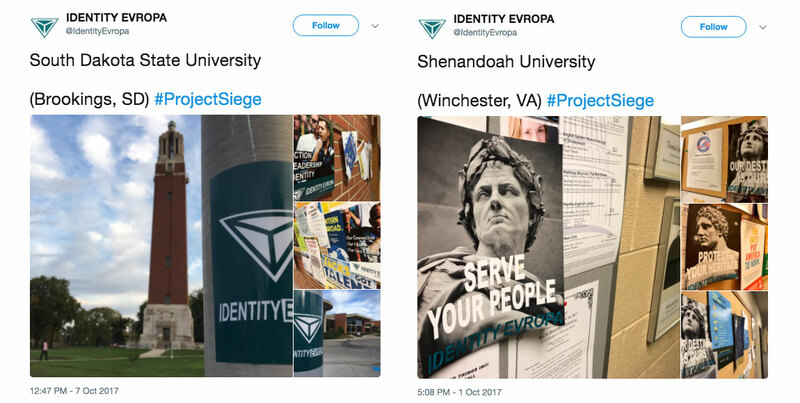 Officially launched in September 2016, #ProjectSiege has coalesced into an effort to recruit college students into Identity Evropa’s ranks of white Identitarians. These recruitment flyers run the gamut from simple stickers depicting only the group’s logo — a blue or white dragon’s eye meant to represent the choice between good and evil — to recruitment flyers pandering to people’s fears of being replaced by immigrants. Their most widespread flyers, however, use simplistic and purposefully vague slogans, such as “Our Future Belongs To Us” and “Our Destiny Is Ours,” superimposed over images of ancient Greek sculptures of Julius Caesar and Hercules. Flyering initiatives associated with #ProjectSiege have experienced surges at the beginning of each college semester, with 23 incidents in September 2016, 35 in February 2017, and 36 in September 2017. Similar to Identity Europa, Vanguard America is comprised largely of younger white men for whom appearance is integral to recruitment. In Charlottesville, Virginia on August 11 and 12 for Unite the Right, members of this organization donned white polos with khaki pants while chanting “Blood and Soil.” Vanguard America’s symbology harkens back to historical periods associated with intellectual innovation and prowess. The Roman fasces featured in the group’s logo is a bundle of sticks around an axe, denoting a magistrate’s power. The symbol also served as the namesake for Benito Mussolini’s Italian Fascist Party. Vanguard America formed out of the Iron March Forum in 2014. The group has developed increasingly fascist and neo-Nazi views, a trend that is reflected in their present flyering endeavours. Examples of Vanguard America’s propaganda include flyers imploring white Americans to report illegal immigrants and encourage the maintainance of racial purity in order to free themselves from the threat of so-called white genocide. Thus far in 2017, 32 incidents of such flyers being posted on college campuses have been reported. With a ‘pool party’ structure centered around local meet ups of forum contributors and podcast pundits, TRS has created a vacuum for disgruntled men to goad each other into embracing rawer displays of white supremacy. Such a space has certainly given way to their offensive, yet comparably sparse, flyering tactics. Only in November 2016 was there a large spike in the group’s flyering activities, with 17 different incidents. Additionally, unlike the aforementioned groups, TRS flyers use a variety of tactics, imagery, slogans and “statistics” to garner attention. Several reported flyers have featured the “14 words” (“We must secure the existence of our race and a future for white children”), racist statistics about intelligence, fear-mongering quotes about “white genocide” and references to Donald Trump being the first step in rectifying white supremacy. Weev, whose real name is Andrew Auernheimer, is an anti-semitic neo-Nazi who has repeatedly targeted printers on college campuses to print racist flyers. In August 2016, Auernheimer claimed to have written code to access 50,000 printers connected to the open web to produce flyers calling for the murder of black and Jewish children. In an early sign of what was to come, Andrew Auernheimer, aka "weev," exploited printers on college campuses to print out pro-Nazi flyers in the spring of 2016. In 2013, Auernheimer was sentenced to 41 months of jail time on one count of identity fraud and one count of conspiracy to access a computer without authorization after exposing a flaw in AT&T security which allowed e-mail addresses of iPad owners to be revealed. The verdict was controversial since weev and his lawyer claimed they didn’t steal passwords or hack into the server. Still, Auernheimer did go to prison briefly before his judgement was vacated on a technicality. After his release, Auernheimer took on a larger role within the anti-Semitic, white supremacist website, the Daily Stormer. 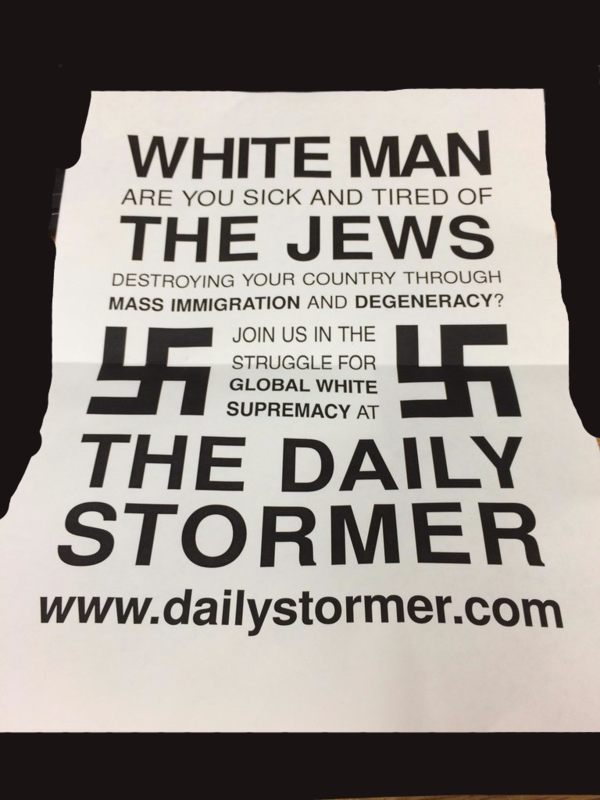 More recently, in March 2016, he hacked printers across the country, this time releasing flyers with swastikas promoting the Daily Stormer. Auernheimer has also thanked Dylann Roof for “his personal sacrifice of his life and future for white children,” as well as praised Anders Breivik who killed 77 people in a political statement against immigration in 2011 in Oslo, Norway. Atomwaffen Division is a small neo-Nazi, neo-fascist hate group that, like Vanguard America, is a product of the Iron March forum. Recruitment flyers distributed by this group feature swastikas and “Black Lives Don’t Matter” slogans while relying on the stark contrast of heavy black ink on white paper. Atomwaffen is also known for another member named Devon Arthurs, who met his three roommates in Atomwaffen’s neo-Nazi chat rooms. Arthurs began his radicalization there before converting to Salafism, an ultra conservative sect of Sunni Islam. “He went from communist to national socialism to hyper-pragmatic capitalism to full ISIS,” said James, a 20-year old “American nationalist” Arthurs also met in a chat room..
Arthurs later killed two of his roommates because they disagreed with his ideology. Police found a framed picture of Timothy McVeigh, the terrorist who blew up a federal office building in Oklahoma City in 1995, on the dresser of Brandon Russell, the third roommate. Arthurs told police Russell had claimed the only thing McVeigh did wrong, was not putting “more material inside the truck to bring the whole building down.” Russell was arrested after police found bomb-making materials in his garage. Hate on campus has experienced large spikes over the last year, including directly after the election of Donald Trump, and during and after his inauguration. In the words of prominent white nationalist Richard Spencer, “people in college are at this point in their lives where they are actually open to alternative perspectives … I think you need to get them while they’re young.” This malleability coupled with college campuses’ design as relatively small, heavily trafficked areas makes them a lucrative recruiting site for hate groups. In his crusade to reach the minds of younger generations, Spencer has attempted to speak on numerous college campuses over the past several months, oftentimes to no avail. Prior to his April 18, 2017 speaking event at Auburn University, White Student Union flyers were posted around campus, heightening security concerns. Both actions, attending a speech and participating in flyering, foster a “sense of identity and connection to others in the real world,” gains that go far beyond superficial chat rooms and forums. Thus, SPLC on Campus also provides students with the opportunity to break with their keyboards and participate in meaningful actions to counter hate and bigotry in their academic and personal environments. Students can find the resources to organize, discuss and translate their concerns into tangible action. In addition, if you see or hear of an incident on your campus, please let us know.